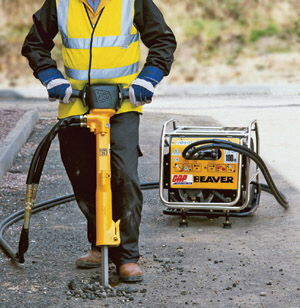 PORTABLE GAS POWERED COMPACT HYDRAULIC POWER UNIT OPERATES HYDRAULIC TOOLS SUCH AS SAWS, BREAKERS & PUMPS. A 60LB CLASS BREAKER SIMILAR IN POWER TO AN AIR POWERED BREAKER AND MUCH MORE EFFECTIVE THAN A 60LB ELECTRIC BREAKER. GREAT FOR SMALL/MED/LGE. JOBS EVEN WITH MESH/REBAR. FOR LARGER HD JOBS USE AIR POWERED BREAKER SETS. * Please call us for any questions on our hydraulic/powerpack gas 5 8 gpm rentals in Portland OR, Gresham OR, Milwaukee OR, and surrounding metro area.